What Is ItAn image of an article in Harper's Weekly from June 20, 1903. What Is ItA sticker I received after donating blood today. Photo Reflection of the Day #54: Here Comes the Sun! What Is ItThe sun coming over the trees this morning. Why It's today's PickI was coming up the stairs at the right time today to catch this. I liked that the sun was just emerging, creating a bright center to the photo. The cloud line also was spread in a nice parallel to the snow line. The mixture of sun and cloud seemed to make the barren trees stand out so strong while the snow-white foreground feels so ominous. I only wish that I was able to take this without a glass screen between me and the shot. What Is ItThe starting slide for a new course I am teaching. Why It's Today's PickTonight was the first night of a new course I am teaching: Share This: Professional and Organizational Approaches to Social Media. It's the first noncredit course that I am teaching at North Shore Community College and so I was quite excited about it. I figured I would capture the moment with today's pic. Of course, just like my other courses, I got the butterflies and nervousness with the start of a new class. But they were a great bunch and had some excellent questions and points. I hope I hit the right balance of information and ideas to present to them and that it will prove worth their while. I guess we'll find out! 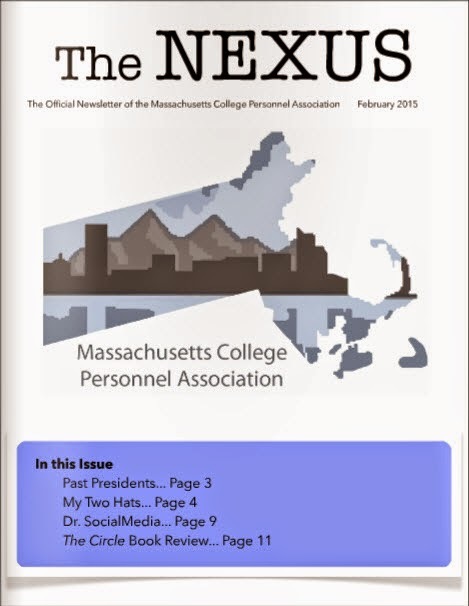 So this winter, a friend of mine asked if I wanted to write a piece for The Nexus, a publication for the Massachusetts College Personnel Association about my work as an Instructional Designer and Adjunct. I took her up on the offer and here is an excerpt. You can read the full article here. What Is ItA hand shadow of a dog on from classroom projector. Why It's today's PickI was always amused with hand shadow puppets but never really good with them. The dog or the fighting squirrel were the best that I could do. And yet, I am inevitably tempted whenever this is the chance to make shadow puppets. In this case, I was waiting for a computer to book up while the project was on. In thinking of shadows of course, it's easy to slip into discussion of facades and even "the cave" but in such a vain, they remind me more of movies and fiction--they are not real--in fact, to some degree, they block out the real (i.e. light or living actual life), and yet, they provide something worth considering when not engaged with them. I think about how all the stories (shadows) move with me through my life and it's rather rewarding. By the way, can you tell that I composed this before my literature course. What Is ItSelfie with a headset microphone on. Why It's Today's PickWow--I missed the last two days. I ran out of time and just had trouble focusing on something to capture with the camera. That might also be why Selfie-Sunday is useful as I can't argue about not having something to snap on these days. Here we go again with a few weeks of stubble. The hair comes in and my receeding hair line becomes clearer and clearer. I figured I'd take a picture with the headphones as I was making mini-lectures for my online students. You can always check out my videos on one of my two YouTube stations. One is my personal account and the other is my school account. If you noticed, I have a slight cut on the right side of my nose. Bear got a little too frisky the other day. What Is ItA picture from inside the Kansas City Airport. Why It's Today's PickI went on a trip to Kansas City and thought I would miss the snow. Apparently not. However, it was kind of cool to watch a flurry of snow come down into an open field and watch as moving vehicles and planes created new tracks. It was also fascinating to see the horizon nearly disappear entirely in mixture of snow showers and gray. I also always find the ports that connect to the plane fascinating in an umbilical chord kind of way, so to see the open end of one (number 58 to be exact) to be curious. What Is ItA wall of cameras at a the local Chuy's in Kansas City, MO. Why It's today's PickI initially took this pic as my pic of the day, thinking it would be cool to see a pic of cameras. But I rushed the shot and it came out blurry. I initially thought this was a lost opportunity but then I said "The cameras are out of focus." The idea of a whole wall of cameras being out of focus then hit me as a fascinating concept and I realized that it was a perfect picture and title. It was a very cool wall in general with its array of different cameras from different times and places. I wish I had more time to capture more pictures or just slowly look them over. What Is ItAn abandoned hallway at Logan Airport in the wee hours of the morning. Why It's Today's PickI walked down the empty halls from my car in the parking lot to my terminal and it was downright eerie, the silence. No music, no hum, not footsteps besides mine. I turned and saw this and felt the need to snap the picture. There's often such a strange experience when standing in typically crowded spaces but only to hear silence and see no one in sight. I liked this particular shot because there is nice symmetry to it but also the line down the middle at the top and reflecting upon the floor. I only wish I had taken a second longer and crouched a bit so that it looked like the lines met at the incline. Here is a book review that I published for the Northeast Popular Culture Association (NEPCA!) from last month. "Revising their 2003 first edition (subtitled: The Rise of Computer Game Culture from Geek to Chic) Brad King and John Borland set off on their own adventure to show just how far role playing games have gone from the tabletop beginnings of Dungeons & Dragons in the 1970s to the massive multi-player online games of today such as World of Warcraft. In doing so, they craft a bridge of history that explores how tabletop gamers of yesteryear went on to become the programmers and entrepreneurs who delivered many of the best video game and group-player experiences of the last twenty years." For the rest of the review, please visit the NEPCA Website. What Is ItAn ice-ball with blue dye in a snow bank. What Is ItSelfie of me with two weeks facial growth and glasses. Why It's Today's PickThis week's selfie is a bit of a perplexed look or one of consternation...I'll give you a single guess and a single clue...it's starts with S and it blows! Beyond that, it's clear to see that 2 weeks have passed since I last saw the wrong end of a razor and I'm spotting my glasses as I felt my face needed something else to round it out. These selfies are an interesting exploration into the study of self. Like many, I take fault with how I look and can never seem to capture with a camera how I perceive I look. No surprise there--my perception is horribly biased (just like everyone else's!). I find it interesting that the hardest picture to capture each week is the selfie. I usually do at least 10 and some times many more before I settle. Maybe my look of consternation is more about that than about the snow. Photo Reflection of the Day #45: The...ummm...Ladies Room? What Is ItThe door to the ladies room at Harvest of Hope in Peabody. Why It's Today's PickI couldn't resist this set up when I stumbled upon it while visiting Harvest of Hope in Peabody. The rusting door, worn walls and edges and padlock hinge create such a feeling and security. I found the door creepy but then even more so when I noticed that it was the "Ladies Toilet" as the letters spell out on the right. If I were a woman I would have felt utterly obligated to at least open the door and see if the inside was as bad as the outside...or run screaming from the place, believing that I had just found a hellmouth. Either way, it's definitely an entrance that leaves one hell of an impression! What Is ItSnow dust blowing off the Berry Building at North Shore Community College in Danvers. Why It's Today's PickComing into work this morning, it was beautiful to see the light dusting of snow swirling around with the fierce wind and accompanying cold). I saw it coming off the roof and wanted to capture it. In some ways, frozen in a photo (pun intended), it looks like the building's essence is being siphoned away or as if the snow were steam arising from the building. I was hoping for some better photos but the cold got the better of me. Of course, it was more clear with my eyes, but you could see the moon just above the tree. If I had more time to align it all, I would set it up so the longest branch was pointing to the moon. Photo Reflection of the Day #43: Fearless Ave in Lynn - So True! Why It's Today's PickI saw this while making an hour-long commute to work--a commute that is typically about 20 minutes. I had seen the street before and thought about snapping a photo--today, it was ideal. It helped to remind me and relax me. The commute can be frustrating, especially when it take so much longer than usual. At the core of that frustration, I tend to think there is a bit of fear--fear of wasting one's life away in traffic. I also liked the idea of "Fearless" sticking out on top of a snow pile as at this time of year, it rather useful to keep in mind. Yes, more snow is on the way, but fearing less is likely to get us through it. I also like this photo because despite the mound of snow in the front, there are lighter skies in the background, promising that spring may just yet arrive! Photo Reflection of the Day #42: More of the White Stuff! What Is ItA picture from Berry Building at North Shore Community Campus looking over another building and the woods. Why It's Today's PickI looked out the window before a meeting and snapped this. So much snow everywhere, shades of gray and white, mountains of snow beyond the bare trees, and men on the roof, using wheel barrels to dump snow. A crazy winter indeed with as you can tell from the photo more snow coming down. It wasn't extensive snow by any means--a dusting, but it just seemed to come down as a spite to all of us bemoaning the snow thus far. However, when I don't think about the massive amounts of snow, there is a beauty in the fields of white before me with thick flakes parading down, covering the reaming dark spots of the terrain. What Is ItA piece of paper with a bunch of googly eyes on it in the form of an eye. Why It's today's PickAnother day of shoveling, running, and doing work and I didn't manage to capture an outdoor image--though I wish I had time as there were a few shots that would have been great. Instead, I decided to throw out some googly eyes for this picture. I keep meaning to get some glue and start to glue googly eyes in random places. But until then, I found this to be an interesting use of eyes shaped into a eye-shape. I didn't realize it while I was taking it, but the reflection from the ceiling light in present in all of them and you can actually see some reflection in of the room in many of the eyes. For some reason too, I thought using lined paper was a good choice. January was an ok reading month. It's not too surprising with the start of the semester, a move, and several other projects to keep me busy that my reading was fleeting. I read 30 books in total, but largely because I was on a graphic novel kick, trying to finish up the stack I had accumulated over December and January but was too busy to read. I would love to talk a lot about the books that I read this month but since they are ones that I am reviewing for other publications, I would have to wait until later to do that. 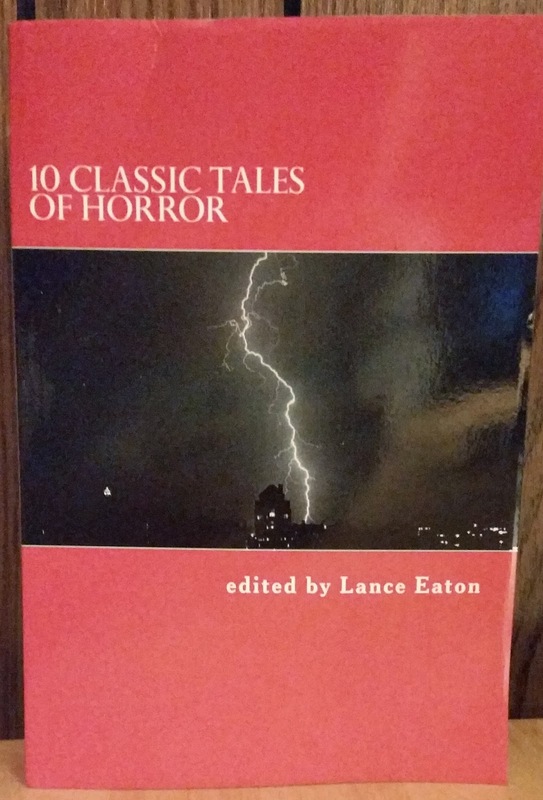 However, I am happy to talk about the book that I self-published recently as one of my reads for the year. You can purchase it on Amazon, though I'm also giving it away the digital version here for free. So what's the reading breakdown for the month? What Is ItA shot of my fruit salad in front of the window (and on the breadmaker). Why It's Today's PickThis was a pretty epic bowl of fruit. I had just finished running on the treadmill and was looking for some breakfast and pulled together two clementines, an apple, a banana, half a dozen strawberries and a handful of blackberries. Beyond tasty, it was colorful and I thought it would make a great contrast to the whiteness outside as we are being covered in another foot or so of snow. I think I also liked the contrast because it reminds me of the privilege I experience, being able to have fresh fruit at my leisure, secure and warm in my home despite the harsh conditions out there. And in that I am grateful. That is something that can be so easy to forget for people but I always like to keep it in the forefront of my mind.